Where are strawberries grown, or produced--learn the answer here. Species of strawberries are grown in all but the highest polar latitudes, both north and south. In fact, strawberry species are indigenous to nearly all of the northern hemisphere and most of the tropical regions of the world (the native range of strawberries in the southern hemisphere is limited primarily to parts of western South America). In the U.S., strawberries are grown in family gardens in all 50 states. There are very few places on Earth in which no strawberry species will grow. 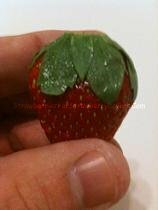 However, almost all commercially produced strawberries come from the northern hemisphere. The largest strawberry producing country is the United States, growing 20-25% of the world's annual production; Spain is the world's second largest producer, with about 6-7%. Spain is also the world's largest exporter of fresh strawberries (Poland is the world's largest exporter of frozen strawberries). California dominates U.S. strawberry production. The state's annual harvest consistently approaches nine-tenths of all U.S. strawberries. Most strawberry farming is in the southwestern counties of the state (particularly along the coast), where full sun and a mild climate predominate. Florida is the second largest producer of strawberries in the United States at 8-9% annually. Plant City is the epicenter of strawberry farming for the state. Most of the strawberries sold in U.S. groceries during the winter (especially in the months of December and January) come from Florida. Together, California and Florida account for well over 95% of all strawberries grown in the U.S.A. This is largely due to the fact that the mild winter climates of these states allow farmers to utilize hill cultivation on their strawberry farms. In contrast, other states rely heavily on matted row cultivation of strawberries, a form of strawberry farming that cannot offer comparable yields to hill cultivation. For more information on hill and matted row strawberry cultivation, go to the "How Are Strawberries Grown" page on this site.